Meet Me in Philadelphia: Linen Napkin Giveaway Winner! Last week, I shared a sewing tutorial that covered creating eco-chic cloth napkins that even the most novice sewer could easily tackle. Along with the tutorial, I offered a giveaway for one lucky follower of Meet Me in Philadelphia: a set of 4 linen burlap napkins in a warm mustard made by moi. Thank you all for entering, but there could only be one winner. Congrats to Caroline of A Flair for Vintage Decor, who is such a lovely blog friend! Caroline, I'll email you to arrange shipping these to you. 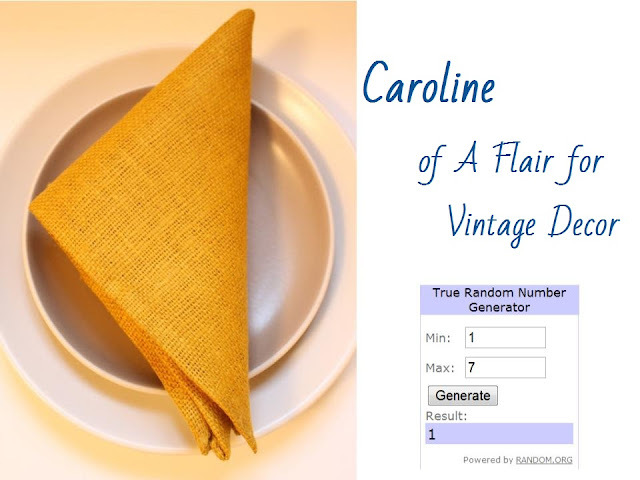 If you didn't win, be sure to try making your own cloth napkins--I'd love to see your creations if you do. Thanks again for entering and thanks to Online Fabric Store for providing the fabric for this giveway! Congrats to you both. The napkins are so uptown and Caroline is a sweetheart. Happy for both of you! Congratulations, Caroline. Enjoy your lovingly made cloth napkins.